So You Want to Move to the North? We’ve been making shopping excursions to the NorthMart, Ventures and Quick Stop our entire stay up here but ever since moving to Inuksugait blue we’ve found that trekking down to the shore (even though it’s a relatively short walk) can be a pain in the arse when you got a lot of bags. Sure cabbing it is an option but we’re trying our best not to rely on that too much. The walking is great exercise and besides it helped us cut down on the amount we did end up purchasing. Anyway, one day while making a pit stop at the Quick Stop, Suzanne mustered up enough courage to ask the girl at the counter where the mythical place known as the Canners actually was. We’d been dreading asking anyone to point us in the right direction for fear of sticking out any further than we already have as n00bs in the area, but curiosity got the better of us. We’d heard so much about their operation since coming up here; their odd hours, cheap prices, and random selections of “mystery freezers” compelled us to find out one way or another. After slapping Suzanne with an “are you kidding me” look the girl smiled and politely told us it was right down the road. I was taken aback. I’ve looked out from our balcony numerous times. I’ve never seen anything that even remotely resembles a convenience store. Only the airport in the distance, the ski-doo shop right next to us and a tiny run down micro-warehouse just down the road. Wait… I thought to myself… that couldn’t be it, could it? Appearances definitely can be deceiving. Nestled inconspicuously between the Inuksugait blue and the Governor is our new favorite little shop known as Baffin Island Canners LTD (or the Canners by locals). It’s a mom-and-pop type operation that imports a variety of perishable and non-perishable goods and sells them at reasonable prices. Well… as reasonable as a $13 bag of milk is up here. When compared to the $15 – $17 price you find elsewhere it ends up being worthwhile. Truth be told, if you weren’t looking for this place you’d never know it existed. It’s kind of off the beaten path. Not on a main road like most other shops but that doesn’t mean it doesn’t get insanely busy. At any given time (during their 8 or so hours of daily operation) you can see a handful of cars loading up boxes upon boxes of goods. I for one had never paid the activity much mind when I think back to the times I looked out at it from where we are. I merely thought it was the every day ins and outs of a little warehouse. I remember talking with *Northern Mike a while back about the state of development that Iqaluit was in. He refered to it as the Old West with its unpaved roads, multipurpose buildings, privately owned businesses, small town gossip and community atmosphere. While I totally agree with that assessment, I liken it more to my favorite video game series – Fallout. Those unfamiliar with Fallout it’s basically a post apocalyptic game that takes place a number of years after a World War III nuclear holocaust. The remnants of mankind are strewn out across the wastelands trying to live in the new hostile landscape. Some groups of people establish small communities that have everything from local governments to merchants that sell anything and everything. Nearly every building, shop and dwellings is constructed from the scraps and pieces of the past and nothing is without some kind of value – even the slightest things. 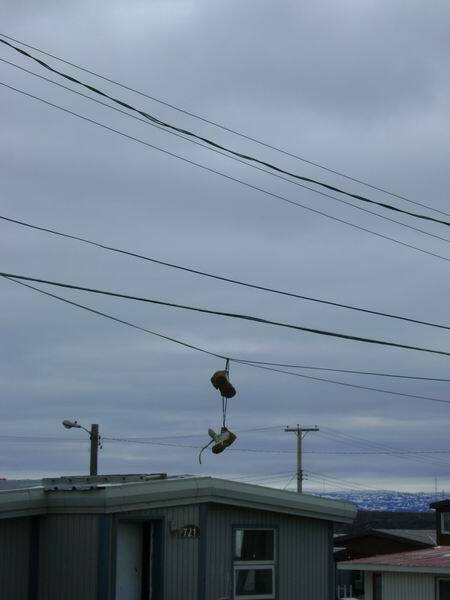 It’s all about function over appearance and I think that’s the tie that binds regarding Iqaluit and its infrastructure. The Canners falls right into that classification. When you approach the building it doesn’t look very inviting. In fact when we first went there I thought we were on like private property and would be kicked off. As you get close to small wooden enclosure protecting the doorway, you can see their store hours. That’s how you know you’re in the right spot. Upon entry the world changes. You go from the desolation of the outside to the bustling activity of a place with far too much business and too little space. There’s not much to the layout. 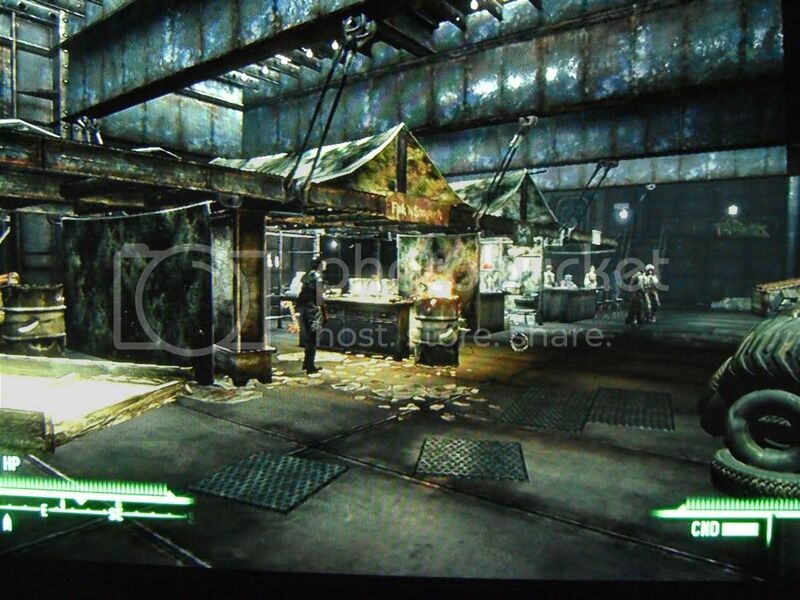 You walk in to a hallway lined with both standing and chest freezers. To the right is their warehouse. No entry there so you’re prompted to head left down the hallway. They have a variety of frozen and refrigerated goods from milk, ice cream and butter, to frozen fruits to an all pork freezer. The offices are at the end of the hallway so you can’t go straight when you reach the end. You can only veer lazily to the right where you end up near the cash registers. If you keep going right though (almost making a 180) you end up in a small room with all kinds of cheeses, fresh fruits and meats as well as breads and vegetables. When you navigate your way around the room you find yourself back at the cashier room again. It too is lined with various types of sundries from pop, toilet paper and cereals to cleaning products and condiments. There are also two more mystery chest freezers marked “Seafood” and “Beef”. There’s no guarantee what will exactly be in there on any given day (meaning what types of seafood and beef) but it’s always fun to just dip in and see what’s available. On a busy day it can be quite chaotic in there. It reminds me of the Soup Nazi in terms of how you have to know what you’re doing, what you’re getting and where to go. There’s no browsing when it’s busy. You need to go in there with a game plan or you’re definitely going to screw up the natural order of things. All in all it’s a great place to shop. They owners and employees are kind and helpful, the prices are good and for us the distance is awesome. Nothing like literally popping downstairs and getting all your shopping done. So if you’re new to Iqaluit and haven’t done your homework, try popping on over to the Canners. It’s an interesting experience to say the least. *Northern Mike refers to Mike that helped us get our apartment up here. Since Suzanne has introduced so many Mikes into my life I have to refer to them with different monikers i.e. Uncle Mike, Brother Mike, Little Mike, etc. …and then along came Winter. So having mocked our dear friends and family in their south over their snowfall hardships, Old Man Winter sneezed last night and let Suzanne and I know he’s beginning to stir. For the first time since we got here the temperature finally dipped well below freezing. It was nothing comparable to the bone-chilling temperatures the dear folks out at Baker Lake had to deal with, it still served notice to the both of us that this is real deal cold. I finally had a chance to break out my parka. As I set out to go meet Suzanne at Inuksugait I was met by some pretty vicious wind hitting me dead on the entire walk. The snow was lightly falling but with the wind gusts it felt like I was being sandblasted. I couldn’t tell if I was leaking out my nose or if it was just the snow melting on my facial fuzz but whatever it was froze into little ice clumps on my ‘stache. As I trudged along my glasses (which are scratched already and my only usable pair at the moment) fogged up only a block into the walk. I could hear almost inaudible crackling coming from around the frame so rather than risk my lenses popping out I had to remove my glasses and tuck them away. This was only -17 c folks with a wind chill in the mid -20’s. It was at that moment, as I had coyote fur whipping into my eyes that I realized this isn’t even a taste of what’s to come. That’s fine with me. I’d rather ease into this brutal cold like an old man getting into a warm bath rather than be violently introduced to some frigid -40 c or -50 c temperatures right off the bat. No I’m absolutely not regretting coming up here. In fact that taste of the cold invigorated me quite a bit. i was going a little batty being stranded in this bloody hotel for going on 3 weeks now so any chance I get to go outside – even if it’s wicked out – I take advantage of. 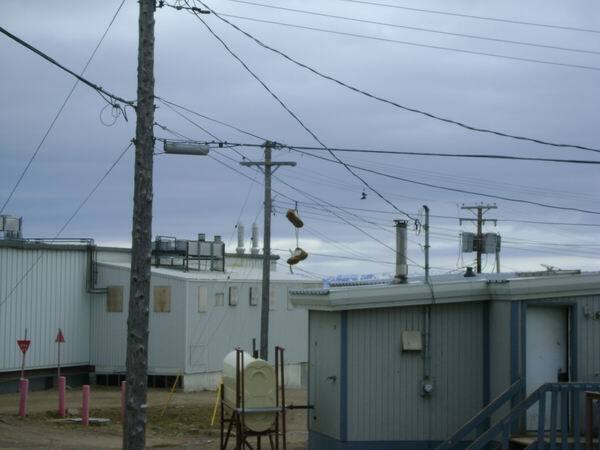 As always, remember to visit the Photobucket Iqaluit Photo Diary to see all the pictures we take including the unpublished ones we don’t end up posting here.